Tips and techniques: Add more ore less jalapeno depending on your adventure with the heat. Heat the whipping cream and 1/4 cup sugar to just below boiling. While the cream is heating, whip the yolks with the remaining sugar, the lemon juice and the lemon zest until the yolks are fluffy, pale and doubled in size. Temper the eggs with the warm cream by adding a few drizzles of cream to the whipped yolks, stir and add in a few more drizzles until most of the cream has been added. Pour the yolk mixture into the cream pan and return to medium low heat. Cook slowly until the custard thickens and stir often with a wooden spoon; test the thickness by running your finger across the back of the spoon. If the line holds, it is ready. Remove from heat and set in an ice bath until cooled. Cover and let the custard steep in the refrigerator overnight if you have time; otherwise just until the custard is chilled. Strain the custard and place in the ice cream maker, process according to manufacturer directions. While the ice cream is churning, mix up the jalapeno sugar. In a small Cuisinart, add the chopped jalapeno and the tablespoon of sugar, chop and blend until the jalapeno is super fine. 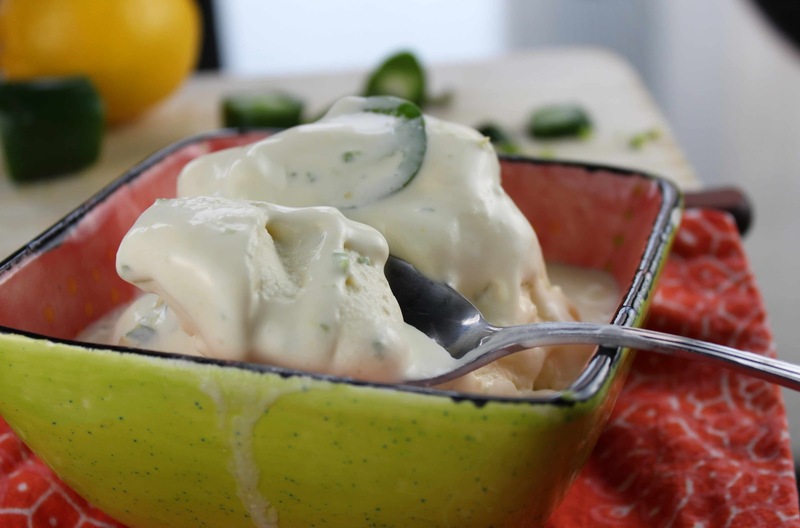 Add this sugar jalapeno mixture to the ice cream maker during the last 5 minutes of churning. Continue to process as directed. Homemade ice cream is best enjoyed within the first few days of making it. Seriously, how is Dave not 100000 metric tons? You are a food wizard, dear lady. Just warning you, I plan to sneak into your place and nibble on leftovers while you slumber. Why? Because I'm hungry. Is it creepy? On a scale of 1-10, I'm definitely a 12. Achievement Unlocked: Gluttonous Scoundrel. dp- we'll leave the side window open for you and a napkin on the table!